My ships have a bad habit of catastrophic failure. Yes, Porkjet did a super awesome job making those, they look lovely. HowEVER, I'd like the old engine models to stay, and perhaps we can just receive the LV-15 and LV-303 as new engines with their current models. Maybe they can tie it into the story line as a new series of engines that Jeb's Junkyard manufactured to move out of the stone age of rocketry and show that they're still a presence in the face of Rockomax and C7. Thoughts? I think we did need an improvement for these engines. I agree the others do too, but in the end I don't really care what order as long as they all get done. I agree the numbers look... unnecessary. We never needed them to be identified with paint schemes before, I don't know of any real world rockets that identify model numbers with paint schemes. I think I would prefer those removed in both locations. I disagree the LV-T45 was supposed to be a modified 30, it's just a series of models. I'm really not sure at all what the purpose of the spheres on the LV-303 is. I guess it should be fuel tank imitating the Fregat upper stage. Could be cool as it will make it an engine-tank hybrid like the Twin-Boar. I don't like the engines. They don't look like any of Porkjet's other stockalike work, and they look like they would be better suited to another game entirely. I don't think PorkJet has done any other rocket parts to be stock alike. 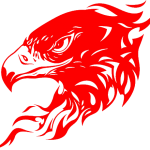 The revamp would be defining a new stock alike. In fact, his Mk2 parts defined stock alike for the planes. All the existing plane parts were re-done to match. I agree the numbers look... unnecessary. We never needed them to be identified with paint schemes before, I don't know of any real world rockets that identify model numbers with paint schemes. Oh the Russians love that sort of thing. Do a Google image search for "Russian rocket engines" and those stencils aren't just for display models, I've seen them on Atlas V rockets being assembled for launch. I'm not sure what the spheres are either, but I don't know all these things. 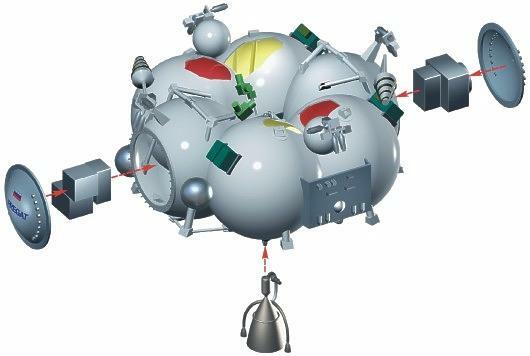 If you look around the bottom of the S-IVB stage, you will see a circle of spherical bottles. 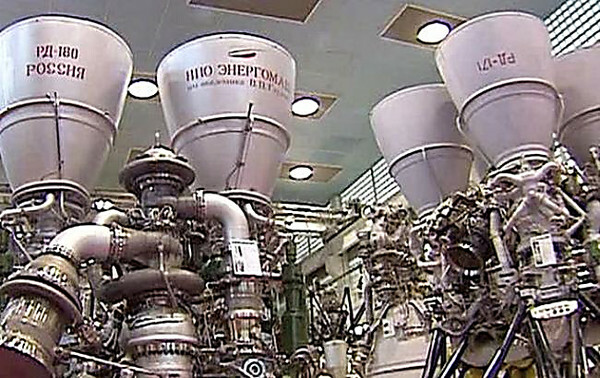 These aid in the restart of the J-2 for TLI by spinning up the turbopumps. The S-II's J-2s don't restart, so they don't have 'em. Fair enough I guess. Though I would prefer them at least a different color on the boat tails, because those will often be used to help blend the design on SSTO planes (aside from the aerodynamic function), and the yellow doesn't match. If they made them black or grey, it wouldn't stick out as much. My "problem" (if any) is that they're TOO realistic. KSP is supposed to be just a bit cartoony and these don't fit. God dammit, why is this so difficult to get across, I'm not saying anything about the other rocket parts because we haven't even seen them yet! I'm talking about the entire goddamned game! The arts look nothing like the rest of the game, and putting them in as they are right now could ruin the entire feel and style of the game! So which is it, are we revamping every single game asset, or can we just have something that looks like KSP? So which is it, are we revamping every single game asset, or can we just have something that looks like KSP? Every single part asset except those that have been recently done since the inclusion of Mk2 please. No need to get hostile about it. Nothing looks like KSP and ksp looks like nothing else it's a seemingly endless loop of madness and the only way out is to rip it all up and replace everything some times more than once. As for not looking like the space plane parts that's just the physics based rendering talking once the plane parts are brought up to the same standard or the engines are brought down to our common man standards everything will sync up. Well, KSP does have a style, and it's the slightly-cheesy '60s "artist's interpretation" done with a cartoonish flair. Why cartoonish? Because KSP has a sense of humor (unlike games like Orbiter) and so when Jeb dies for the 6th time in your career game, you think of Kenny in South Park or Wile E. Coyote instead of Gus Grissom in Apollo 1. You need a bit of a laugh when your 6th attempt at an orbital design has just flipped again and ended up in "an ocean-synchronous orbit"
I hope it keeps the attitude of "moar boosters or moar struts" and doesn't start taking itself too seriously. I like the style of the new engines, and I like the hand-made look of the textures and hope the in-game lighting can get the same effect without killing my CPU. They have the feel that they are from a stop-motion production, the scale and textures look real world yet other worldly, sort of matching the scale of the game's universe. I say great job and I look forward to seeing this treatment on all the parts. Exacty. My point was, if the new parts look so out of place, it won't be unified with the entire game. [snip] to get to the actual point, My above statement remains true. Even if one part of the game is unified, it still will look out of place with the rest of it. Ok, but if they do a few each patch, you will have a few versions where they don't fit together followed by an eternity of absolutely beautiful game. We don't yet know what the plan for the revamp is, but I would think it would include engines, tanks, and pods at the least. I hope some of the little things like parachutes and docking ports also get included. That would cover most of the parts that don't match. In the few times they mentioned it, they have always referred to it as a rocket part update, not a rocket engine update. Granted, that is vague, but I don't think they would just stop here. I like the 'new' engines look. Looks quite different, but I wouldn't mind at all if we get some PBR rending (or however it's called) to finally add some nice lighting effects on KSPs parts. It looks different than a bunch of rockomax fuel tanks. Just... what exactly are rockomax fuel tanks looking like? To me it's just like an outdated placeholder. 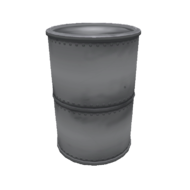 Realism or not, I don't mind metal that actually looks like metal and not like low quality plastic. Fore real. What kind of artstyle is this supposed to represent? @SQUAD has a very apparent aesthetic going on. The new parts, as of right now, do not fit. To be frank, THAT WOULD BE A BAD THING! The plane parts look nothing at all like the rocket parts (aside from maybe the mk1-2 capsule). So the notion of "cartoony" only applies if you consider the spaceplane parts cartoony. I agree they need to pick an aesthetic, but the current paradigm of sleek, cool looking spaceplane parts, and godawful junkyard looking rocket parts doesn't cut it. There are actually people that defend the current rocket parts. Fine, I can live with that, I'll use mods---but then the plane parts need to be dragged down to the awful rocket level to match, pick one style, sleek and cool or; awful, clunky, and cartoony. @Andem Yes, and the revamp would replace that aesthetic over time. As I said, a few parts each patch. The plane and rocket part aesthetic doesn't match now. Ideally by the end of the revamp it will. I'm not really sure what your video is for, we haven't been talking about graphics at all. The 1.25m engines are sort of the best of the rocket parts right now. The 2.5m parts are the worst all around (everything except the mk1-2 isn't fit to keep at all, IMO). The smaller engines are also lousy, frankly. All the decouplers are terrible except the largest one and need to be killed with fire (they need to be smaller, and/or flush). The probe parts are mostly clunky. Still not my point. The point is, radically changing your aesthetic after a release is a bad idea. I wouldn't care if the change wasn't so absurdly different, but the engines in particular don't even remotely fit at all. They have a general aesthetic already, now they should be making the parts look good in that aesthetic, not completely changing it. I consider the current 1.1.2 spaceplane parts the perfect aesthetic, as it matches the rest of the game quite well. If the focus was on bringing the rocket parts up to snuff, that would be one thing, but the picture in the OP is clearly displaying something entirely different and alien to the rest of the game. The point is, They have an aesthetic, and they should stick with it. Do you think it would be a good Idea for TF2 r Overwatch to suddenly change it's aesthetic? Why would that be any different from KSP? I disagree there. It's not like the word "release" has ever meant anything to Squad in the past. I think if it's an ugly aesthetic it should be replaced, regardless of the game being "released". Is it really that different? There is nothing in the plane parts to compare with rocket engines and asside from the yellow which I mentioned my dislike for earlier, the Boat tails match the planes quite nicely. Spaceplanes are powered by magic pixie dust. Ie: they are not a thing in RL. As such, I expect them to have a more sic-fi feel to them (though if I were starting KSP from scratch, my style would have been "retro future" (a 1950s and 60s envisioning of the future)). Rocket parts should always come before spaceplanes, unless they have a starting set of spaceplane parts more akin tot he early X planes like the X-1. As such, the early rocket parts (the 1.25m ones) should have an older look to them, as long as the end point of rocket evolution in KSP ends up in the same place as the spaceplane parts (and you can see the evolution). 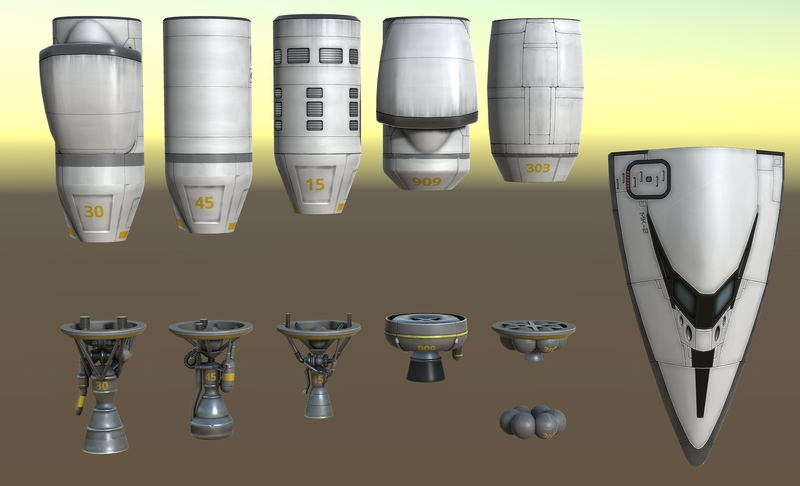 The part progression need not all match, it needs to tell a story basically, of the evolution of Kerbal spacecraft. It's OK for the early parts to look... early. Then, when that is done, they can add in some sleek parts in the more modern style for later rockets (a set of more Merlin like 1.25m engines, perhaps). The point is, radically changing your aesthetic after a release is a bad idea. That's not valid when ksp's release was in name only. Also it's a bad idea to not finalize and unify your aesthetic before release. failing that the aesthetic and balance overhaul's are still painful band-aid rips that need to happen. If you are unhappy about this take it out on those responsible for the console deal and not porkjet who's been working hard to fix this mess and do the games potential some justice.